To share or not, it’s up to you. Peruvian-style jumbo fluke sashimi, served with special spicy sauce (spicy). Peruvian-style tuna sashimi, served with special lemon and spicy soy sauce (spicy). Yellowtail sashimi seared with garlic, and served with yuzu, ponzu and chili oil. White fish marinated in lime juice, served with sweet potatoes and corn (spicy). 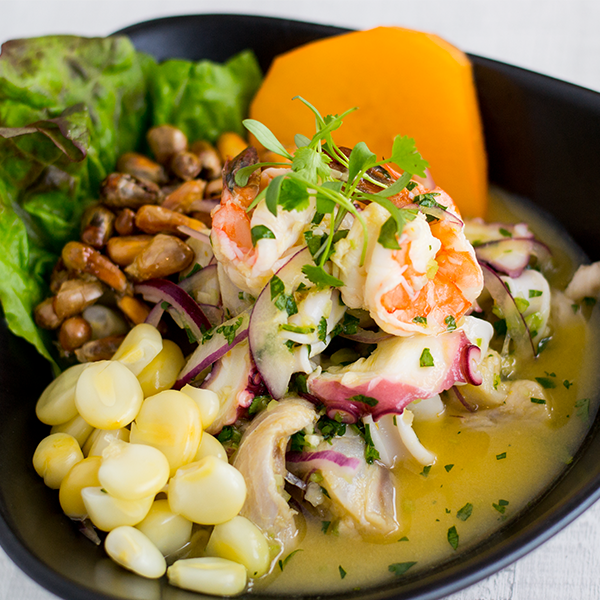 Mixed seafood and fish marinated in lime juice, served with sweet potatoes and corn (spicy). Fresh mussels covered with marinated chopped onion and lime juice (spicy). Tender octopus with botija olive sauce. Fried Yuca with spicy cheese sauce (vegetarian). Mashed potatoes stuffed with seasoned ground beef, served with salsa criolla. Whipped potato with aji amarillo filled with imitation crab and avocado (spicy). Boiled potatoes topped with spicy cheese sauce (vegetarian).